See how the balconies have been extended and enclosed. Most have windows that open. Makes for a very beautiful exterior. Other pictures follow. Our day begins with a nice, easy morning, dawdling over breakfast:-) Our regular breakfast at the hotels is usually a selection of yoghurt, breads (croissants, included), orange juice, cereals, boiled eggs (cold), plates of cheese and meats, potato pie and excellent coffee. We may have as much as we wish. Often we have no need of lunch while we are walking —just beverage breaks. Later in the morning we try to catch up on our blog. Dad has organized a picnic so we head out to a lovely park by the Rio Ebro. We have a very nice time. 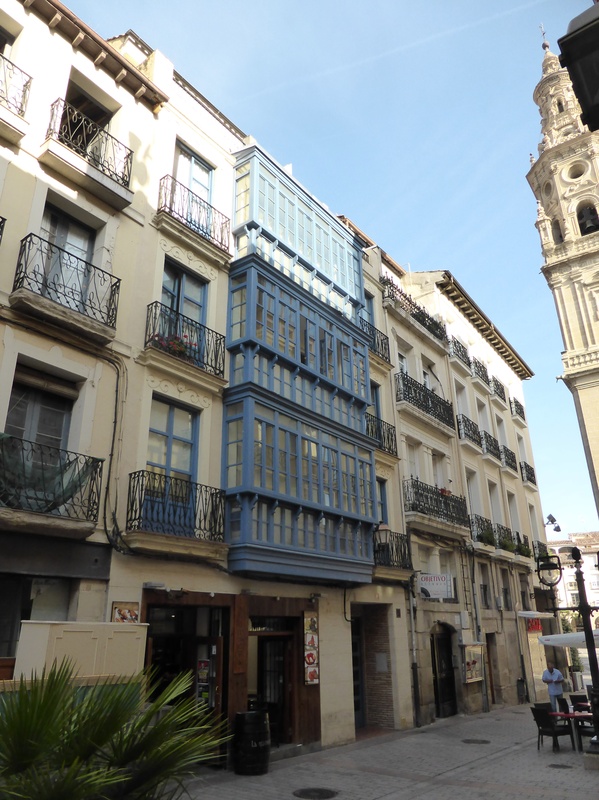 Logrono is a large town ( 153,000) with a university. 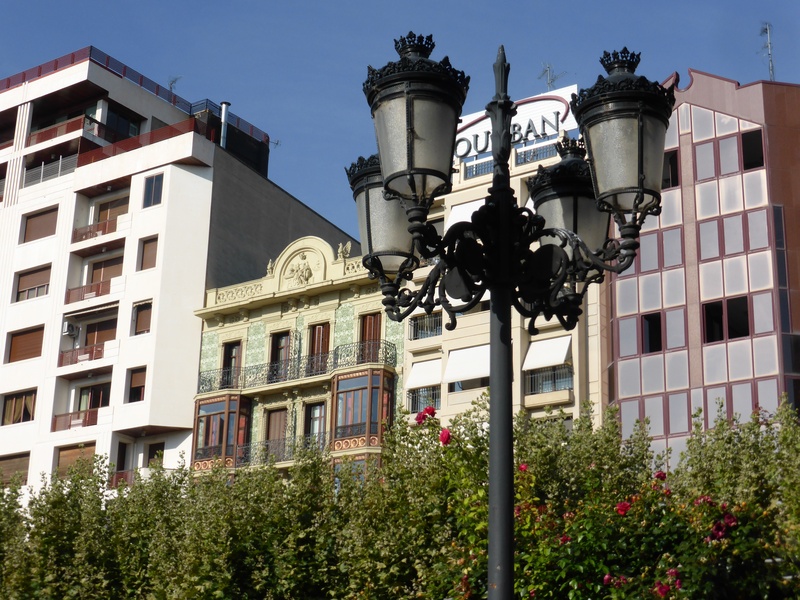 It us the capital of la Rioja region famous for some of the world’s best red wines. The wine is served icy cold and is delicious. As with many of the towns along the Camino the streets are lined with London Plane trees which offer welcome shade. They are pollarded to keep them shorter and bushier, thus providing more shade. 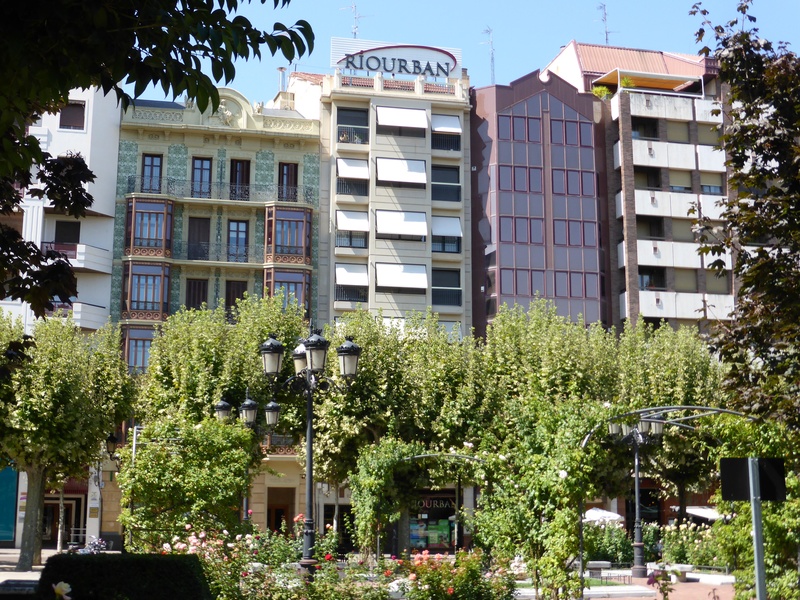 Logrono is a gardener’s delight. It has many parks with rose gardens and oleander blooming. There is a distinctiveness to the architecture, too. Small balconies large enough for only a row of plant pots are framed in windows of various shapes and sizes. This offers a sense of spaciousness and has a nice effect. We have heard of the game of “Goose” related to the Knights Templar who supposedly protected traveling pilgrims. Outside St. James Church there is a giant “Goose board”. There are legends about the game having cabal ties and being a way to pass secret messages…. There are several large churches in Logrono —Iglesias de Santiago el Real ( mentioned above in English) depicts St. James appearing from heaven to help the Christians defeat the Moors in this spot, thus ending Muslim rule in Spain. After a delicious pintxos supper at a nearby outdoor spot we ready ourselves for the day to come. Thunderstorms are forecast so we dig out our rain gear. Thank you so much for sending me your blog, it made for fascinating reading! I had been wondering how well you were going to cope with the heat, so different from the Ladysmith area and much more like my area. And after 32 years it is still hard on me! Glad you are having a great time and look forward to hearing more from you.